Basil pesto is a treat and the best way to enjoy basil. And I’m talking about homemade pesto sauce, not the shop bought one form the jar. The fusion of flavours in it is a marriage made in heaven. 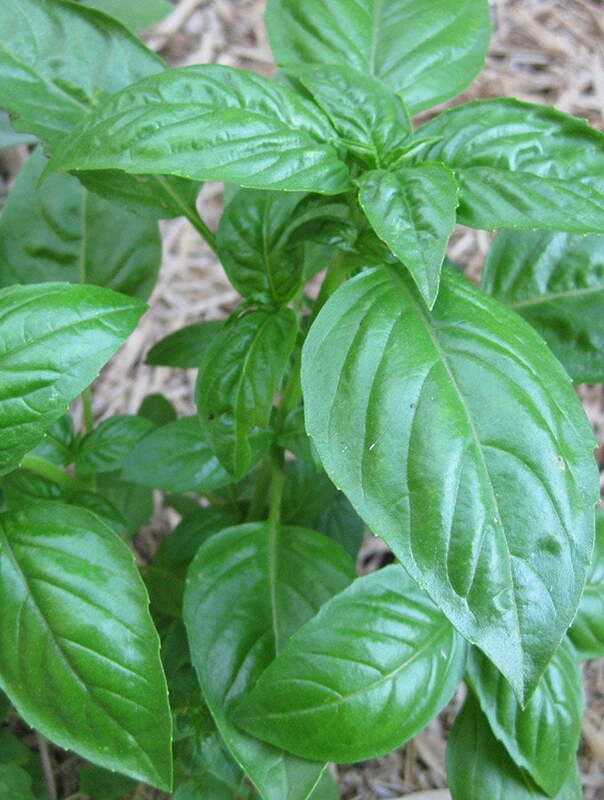 Basil is an annual herb that likes warmth. It’s easy to grow your own in the garden during the summer or in pots indoors all year round. 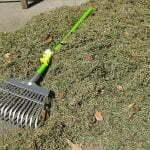 Pick tender leaves regularly to prevent it from flowering and stems getting woody. 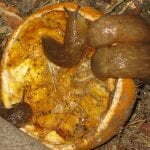 Leave one plant to mature and collect the seeds for the next season. Alternatively, buy fresh basil in shops. 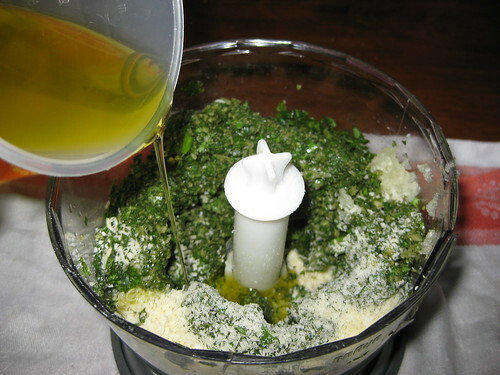 Pesto can be made using mortar and pestle, chopped with a herb cutting knife (takes a while) or in a food processor. 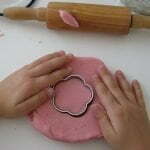 Use the quantities as a guide only and don’t be afraid to experiment. To be honest, I don’t follow the recipe anymore. 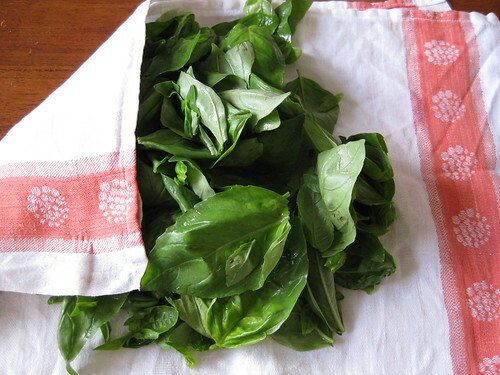 I just pick some basil leaves from the garden, add few cloves of garlic, salt, nuts, Parmesan or Pecorino cheese and some good olive oil. 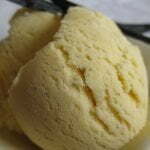 Traditionally, pine nuts are used in basil pesto recipe, but I often substitute macadamia or cashew nuts for pine nuts. 1. Pick the leaves and wash them in a bowl of water. Dry immediately in a colander and then on a clean tea towel. The leaves will turn black if left in the water for too long. 2. 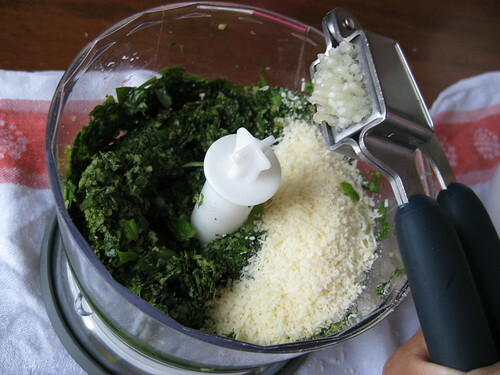 Put basil leaves, nuts of your choice and salt into food processor. Blend it until finely chopped. 3. Add grated Parmesan and crushed garlic. Whiz it until combined. 4. Add olive oil and process again. For a smooth pesto, run the food processor for a bit longer. Basil pesto can be kept in the fridge for up to a week. At my place it disappears mysteriously after a couple of days 🙂 ! Pesto is suitable for freezing. serve with grilled fish, chicken or mushrooms. As you can see one is green and the other – purple! 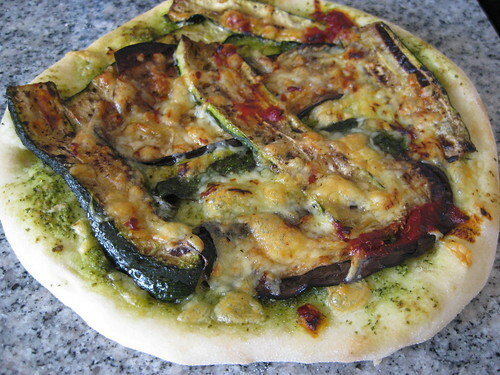 Nevertheless, purple pesto has the same great taste. I really love this purple variety. 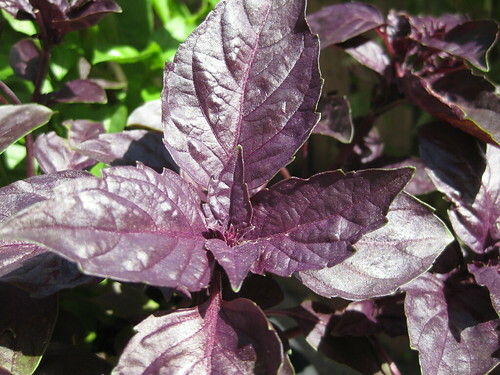 Its gorgeous, strong colour is great contrast to green leaves and makes an unusual garnish. 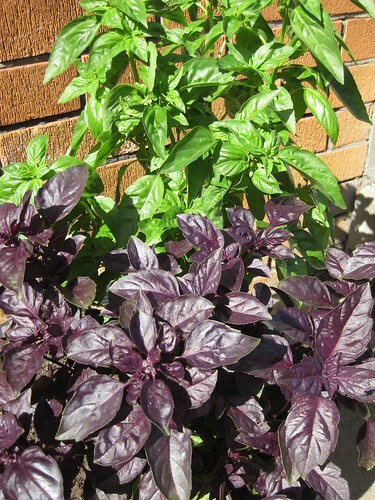 So far, I’ve made about 4 batches of pesto from these two basil plants and they still keep on growing thanks to a sunny spot and homemade compost. 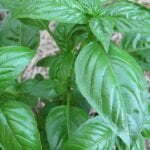 Basil is one of the herbs that doesn’t like cold, so make the most of it while you have it in the garden. For the winter days, if you have oversupply of basil, freeze some. I usually put them into smaller containers or in an ice cube tray. The best way to enjoy freshly made basil pesto is to put it on some crusty homemade bread. 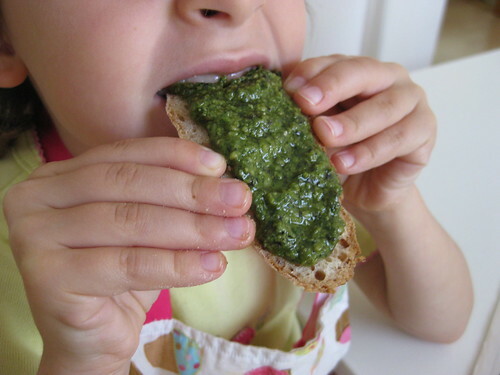 Our daughter gives this batch of homemade pesto thumbs up! I do hope this guide has been useful, please leave a comment below if you have any thoughts or tips on how to make basil pesto sauce. Basil pesto is a treat and the best way to enjoy basil. Pick the leaves and wash them in a bowl of water. Dry immediately in a colander and then on a clean tea towel. The leaves will turn black if left in the water for too long. Put basil leaves, nuts of your choice and salt into food processor. Blend it until finely chopped. Add grated Parmesan and crushed garlic. Whiz it until combined. Add olive oil and process again. For a smooth pesto, run the food processor for a bit longer. 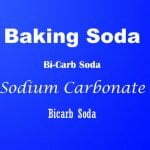 Use the quantities as a guide only and don't be afraid to experiment. To be honest, I don't follow the recipe anymore. I just pick some basil leaves from the garden, add few cloves of garlic, salt, nuts, Parmesan or Pecorino cheese and some good olive oil. 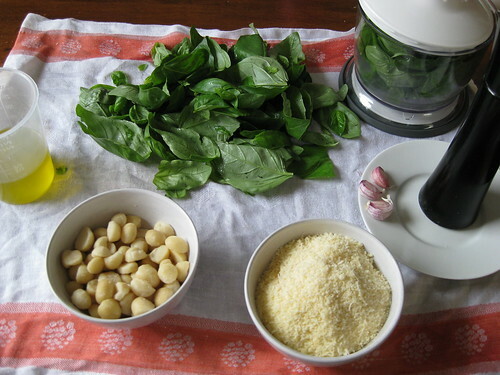 Traditionally, pine nuts are used in basil pesto recipe, but I often substitute macadamia or cashew nuts for pine nuts. You are welcome, Johana! I would love to hear how did your pesto turn out. Now I feel confident about what to do with some of the basil growing overboard in my vege patch! 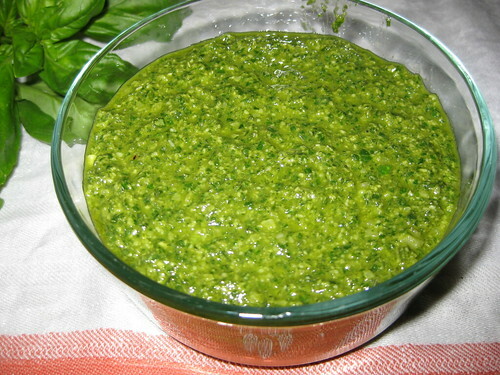 I’ve been using it in sugo, salads & stir fries, but have never been game to attempt pesto. I thought there must be some mystery to it. The fabulous photos & clear guidance make it seem easy. Many thanks. I have made tonnes of your pesto recipe as it is great!! I have not roasted the pine nuts first before and use to add pepper, but yours is much better. Can you tell me what you freeze the pesto in? How long can it stay in the freezer? Do you have any idea on how to pesto? That last question was . . . Do you have any idea how to JAR pesto? 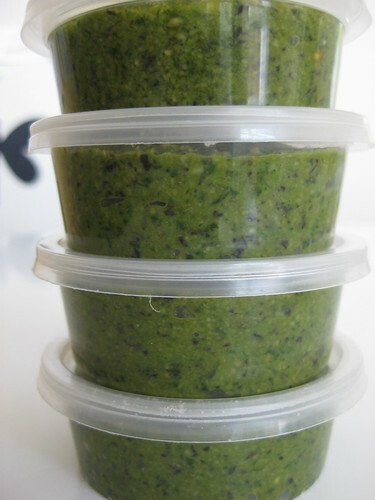 I freeze pesto in freezer safe glass or plastic containers. Fresh pesto is best consumed within a week and should be kept in the fridge. I haven’t tried to JAR it for a longer shelf life. I assume that shop bought jars have some sort of preservative in them. So far, I’ve never had a problem with pesto turning black. Basil leaves turn black if they are left in the water for too long or if bruised. Could it bee that the food processor blade is blunt? Hmmm, I never thought of that. Can those blades be sharpened? The pesto turns dark green, not black, and I’ve even tried putting in some lemon juice, which helps but changes the taste. I read you should not even wash the basil, so it’s not water, and I process it shortly after harvesting. Re: freezing- I freeze just the basil and oil and make the final pesto when I defrost it. I believe you can sharpen the blade. 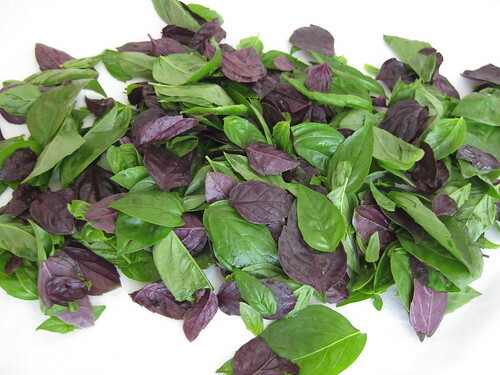 The type of basil plant grown might produce different pesto colour, too. But honestly, if the taste is great, I wouldn’t worry too much about the colour. I haven’t heard of apple being added to pesto, but sounds interesting. I’m curious about the taste and will try it in summer. As for parsley, I’m often making parsley pesto during the winter when there is plenty of parsley but no basil in the garden. We call it our “winter” pesto. You can combine basil and parsley, sometimes I add rocket as well. 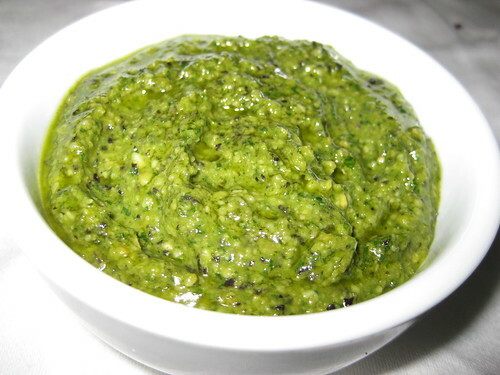 Apple and parsley pesto – that could be a good match and plenty of each during cold months. To lower the calorie content, substitute one peeled fresh tomato for olive oil – it tastes great! Thanks for the recipe, For those that asked about freezing. I use freezer bags from the supermarket. Just put enough in each bag to make a pesto pasta (about the same amount as a store bought jar of pesto), tie a knot in each bag. I do about 5 or 6 basil plants at once which gives about a year or twos supply of basil pesto in the freezer. To use the bags, just put one in the microwave for a few seconds to soften and then tear the bag open to pour the sauce out. curious about the pine nuts. Is there a way to substitute the nuts for something if you are allergic to them? You can use roasted pumpkin seeds (pepitas) or roasted sunflower seeds instead of nuts. For the record, I used 3 decent-sized cloves of garlic and the final result wound up being VERY spicy due to the abundance of garlic. This fortunately went over well with my dinner guests, but those with more sensitive palates (or less of a love affair with garlic) might want to cut it down to 1.5 cloves.